Secretary-General Ban Ki-moon (left) visits the Nagasaki Atomic Bomb Museum in Nagasaki, Japan, in August 2010. In his message to a ceremony marking the 68th anniversary of the atomic bombing of the Japanese city of Nagasaki, Secretary-General Ban Ki-moon stressed that the benefits of nuclear disarmament must be spread worldwide through education. “We must eliminate all nuclear weapons in order to eliminate the grave risk they pose to our world. 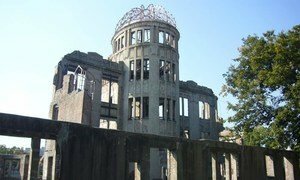 This will require persistent efforts by all countries and peoples,” Mr. Ban said in his message to the Nagasaki Peace Memorial Ceremony. More than 400,000 people died as a result of the attacks on Hiroshima on 6 August, 1945, and Nagasaki, which occurred three days later. The ceremony honoured those who died in the attack as well as the survivors, known as hibakusha, and their families. Mr. Ban said he was “enormously impressed” by the hibakusha’s efforts to educate the world about the full humanitarian consequences of the use of nuclear weapons, and called on civil society groups around the world to help inform the general public about the benefits of disarmament and the terrible risks of failing to achieve it. “I especially appeal to the States currently possessing nuclear weapons, particularly those with the largest nuclear arsenals, to agree on deep and verified reductions, stop developing new or modernized weapons, and accelerate their individual and collective efforts to achieve a world free of nuclear weapons,” Mr. Ban said. The Secretary-General also reiterated the UN’s commitment to nuclear disarmament, noting it is one of the greatest legacies that can be passed on to future generations.